I can imagine Enchiladas con Carne like this being served for decades down in Texas. The kind of meaty, cheesy comfort food cowboys and tourists alike would go for. And talk about going for it – my Dad was in heaven…he would have liked them hotter but we’ve amassed a whole collection of hot sauce just for him. You’ll want to break out the beans (doctor up a can of refrieds if you want to) and rice (this recipe is excellent) for this meal, your favorite salsas and hot sauces, and what the heck, why not have a Margarita while you’re at it. I’ve made this recipe a few times now (yeah, it was that good) but there were a few things I changed from the original. For one, the recipe had way too much flour and the simmering time was way off. I shortened it up a bit, but like any chili, it still takes a bit of time and like any enchilada, they still require quite a bit of work. The one step that you shouldn’t skip is “conditioning” the tortillas. There’s a lot of comments on the NYT site about short cutting this – if you want enchiladas that are crispy and golden on the ends, soft and chewy in the center and that don’t crack, get soggy or fall apart, stick with the recipe. And if you’re worried about dieting and fat, for goodness sakes, choose a healthier recipe – removing the bit of oil to condition these tortillas is not going to make this much healthier. As you can see in my pics, I’ve tried several different cheeses – just like Sam Sifton from the Times said, go with the Velveeta on the top. Yeah. Seriously. Do shop carefully for your ground beef and watch for specials on cheese. Cheese can be chucked in the freezer where it keeps well for recipes like this, but can get crumbly and isn’t so good for just eating. If you have a Mexican market nearby, you can’t go wrong with picking up your tortillas much fresher and cheaper than at the grocery store. Consider doubling the Chile con Carne portion of the recipe and freezing half for another batch, later. Prepare the chili con carne: Put flour in a large sauté pan set over medium-high heat. Cook, stirring frequently, until it begins to turn golden brown and smell nutty, then pour it onto a plate to cool. Wipe out sauté pan add ground beef to pan, and cook over medium high heat, breaking it up with a fork (or tomato masher), stirring until it is well browned, about 12 to 15 minutes. Season with salt and pepper, then use a slotted spoon to remove meat to a bowl, leaving drippings behind. Add onion, garlic and jalapeño to pan and cook, stirring to scrape up any browned bits of meat, for 10 to 12 minutes, or until vegetables are soft. Stir in tomatoes and cook until their liquid has evaporated, then add chile powder, cumin and oregano and stir to combine. After a minute or so, when mixture begins to turn fragrant, return browned meat to pan, along with toasted flour, and stir well to combine. Lower heat to medium-high and slowly stir in chicken stock, 1/2 cup at a time, until mixture has thickened and started to simmer. Lower heat again and allow chili to cook slowly for twenty minutes to a 1/2 an hour, until meat is tender. Add more stock or water if needed. Use immediately, or let cool, cover and refrigerate for up to a few days. Freezes well. When you are ready to cook the enchiladas, heat oven to 425 degrees. In a medium sauté pan set over medium-high heat, heat 1/2 cup neutral oil until it begins to shimmer. Using tongs or a wide spatula, place a tortilla in the hot fat; it should start to bubble immediately. Heat tortilla for about 10 seconds a side, until soft and lightly browned. Remove tortilla and set on a rack set over a baking pan, or just on a baking pan if you don’t have a rack. Repeat with remaining tortillas, working quickly. Assemble the enchiladas: Using a ladle, put about 1/2 cup chili in the bottom of a 9-by-13-inch baking pan and spread it out a little. Roll a few tablespoons of cheese into each tortilla, along with a tablespoon or so of chili, then place it seam-side down in the pan, nestling each one against the last. Ladle remaining chili over top of rolled tortillas and sprinkle with remaining cheese. Transfer to oven and bake until sauce bubbles and cheese is melted, about 10 to 15 minutes. Sprinkle chopped onions over the top, if using, and serve immediately. This tortilla is just right – a bit of golden color, the edges are firm and it has a few bubbles, but it is still flexible. I’ll be bringing this recipe over to Fiesta Friday, cohosted this week by CH @ Cooking From My Heart and Nimmi @ Adorable Life. This entry was posted in Click here for Bargain Meals, Click here for Fabulous Food Posts and tagged Bargain Meal of the Week, canned tomatoes, cheddar, Cheese, Chili, el real Tex Mex, enchiladas, Frugal Hausfrau, Ground Beef, Hot Peppers, Jalapeno, Mexican or Southwestern, new york times, tortillas, Velveeta. Bookmark the permalink. Hi Mollie– wow, I’ve been making enchiladas for years and never knew the part about pre-fying the tortillas! I just dip them into whatever sauce I’m using to soften them and then roll in the fillings. hmmm. Do you think the frying really makes them better?? These do look super delicious! Gracias por la receta!! abrazos!! I really do – it helps them keep their integrity. I think that’s probably more important on an enchilada like this that isn’t completely smothered, so the ends stay all gorgeous. Thanks! I wish I hadn’t run the nutritional numbers!! ha ha ha! those numbers don’t count on weekends. People should realize the amount of flavor that comes from the quick fried tortillas. It adds a layer of complexity and authenticy. I had enchiladas today for lunch, I love preparing them, one of my favourite dishes! Get in my mouth, please! These look AMAZING! Of course I am also a fan of this type of food. Delicious Mollie! Oh, they were a little time intensive, that’s for sure! 🙂 I might try the chili in the crockpot next time, after the first steps. Looks awesome Mollie. I love Mexican food. This is comfort food! yum. Now I know what I am making for dinner! My husband is Mexican so we do lots of America/Mexican food in our house. This was a fun (if a little long) take on that old fashioned Tex Mex chili enchilada. Talk about comfort food! 🙂 I hope you guys like it as much as we did! 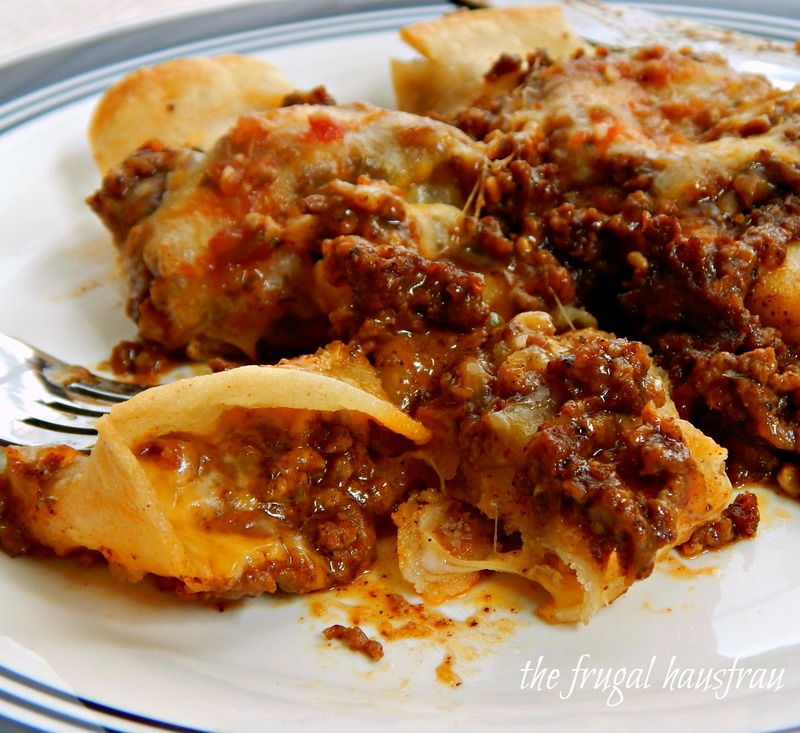 Enchiladas are my favorites..I am sure that all would love to taste this juicy enchiladas at the party.Thanks for bringing such a great dish to the party..
Now that you mention it, it is a perfect “Fiesta” dish, lol! Thank you – and happy FF! This sounds so good! And perfect for Friday. Hugs. I haven’t in the past, but I’ll check and see. Sometimes WP just changes things w/o warning or any explanation. Thx for the heads up. Hope you guys enjoy them! These sound amazing! I will admit I’m a bit surprised by the Velveeta, but we loved chili and cheese dip using it growing up, so I’m easily sold. Now I’m craving enchiladas! Thanks Carlee, they were really great. I was surprised at the Velveeta and didn’t use it the first time. The second time I did and it was great. Much, much better than the mix of Colby/Jack. I made that dip before but it’s been ages – but we used to just scarf it down at potlucks!! I do love Velveeta grilled cheese. Guilty pleasure! I was mostly surprised that the New York Times Food Writer endorsed Velveeta, lol!! These look awesome! I Just posted a tex-mex recipe, too … I think its probably one of my favorite types of foods to make! 😀 Thanks for sharing! Yes, ma’am!!!! This looks amazing, Mollie! lol, and thanks Debbie! Are you back? I remember you were from TX – but then Louisiana isn’t so far. It’s interesting how close those two areas are and how very very different in climate and food. Of course, Texas is so huge! It’s so true!! We’re still relatively close to Texas but LA doesn’t do Tex mex quite right, just like TX doesn’t do Cajun as well as LA!